There is a fascinating shift between the 1921 etching of Indian artist, Mukul Dey (1895-1989), and this bold portrait. We no longer have an uncertain figure, but an artist with a beret, looking out at the world with charm and confidence. Dey had turned up in London in 1920 and he first worked in Muirhead Bone's studio, practising and refining his graphic skills - especially his dry-point etchings, for which he became famous. He then joined the Slade and it may have been Henry Tonks who directed him to Underwood's new, Brook Green School. Dey was the first Indian to receive a Diploma in Mural Painting from the Royal College of Art. He met many prominent figures in the arts - some of whom were, perhaps, enthused by Dey's friendship with and admiration for Rabindranath Tagore, who had won the Nobel Prize for Literature in 1913. Dey regularly exhibited in London including, in 1923, at the Royal Academy. He returned to India only in 1927 and, the year after, he was appointed the first Indian Principal of the Government School of Art and Craft in Calcutta. 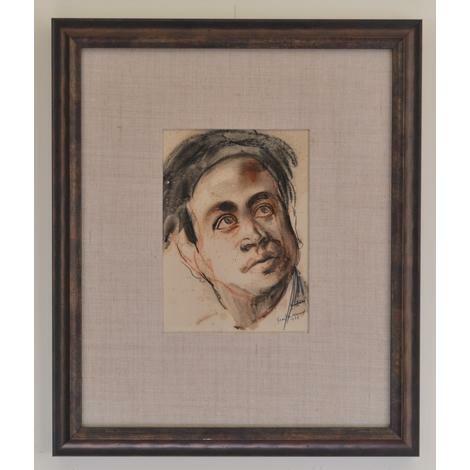 Mukul Dey, then, was to become a leading figure in establishing and promoting links between Britain and India, admiring and celebrating the cultural life of both countries (his work now commands considerable attention when it appears in the auction houses). In Underwood's wonderful, fresh and warm portrait of Dey, executed in 1922, we find a young man at the threshold of this exciting future. The humanity of the portrait, as well as the vivid evocation of form, space and character by the simple device of asserting vibrant light and shadows, suggests that Underwood had translated into charcoal and sanguine some of the skills he had mastered in his etchings of this period.